Raised as a healer, but forced to be a warrior, Alani is all that remains of her order after Rendain’s Imperium stole the oceans from her world. Through meditation, intense focus, and warranty-breaking misuse of water-soluble nanotech, she can summon tidal waves with the flick of a finger. Consumes all Osmosis stacks to heal an allied target. If untargeted, Wellspring heals Alani for half the amount. Healing amount is increased by Osmosis stacks. Alani hurls water bolts using Ket, her order's martial art. Successful hits increase stacks of Osmosis. Hurls a wave that deals damage, pushes away enemies, and leaves a trail of water that hastens allies. Riptide’s trail of water lasts for several seconds. 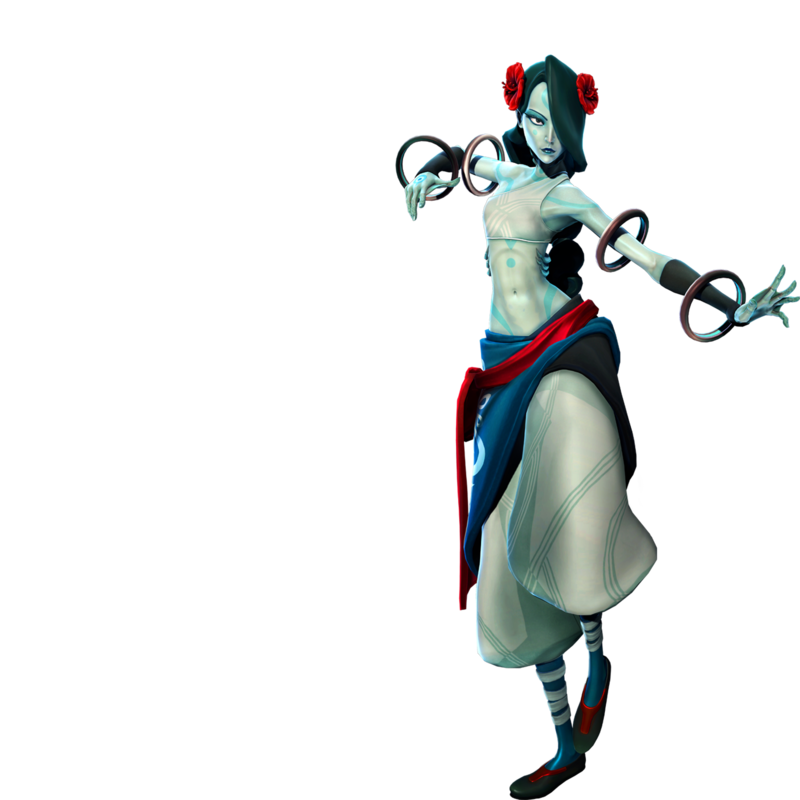 Alani causes a groundswell to erupt at a targeted location, knocking enemies into the air, dealing damage, and binding them. Marks a target enemy or location, summoning a water dragon that deals damage to enemies caught in its wake. Successful hits with Torrent hone Alani's connection to the water, generating Osmosis stacks and increasing the healing power of Wellspring. Riptide’s pools heal friendly targets over time. Torrent projectiles bounce between enemies bound by Geyser. Increases the attack speed of Torrent. Riptide slows enemies that are hit by it. Obtaining an Osmosis stack temporarily increases Alani’s Torrent damage. Geyser generates one stack of Osmosis per enemy knocked into the air. Torrent projectiles travel farther and generate Osmosis stacks faster. Increases the duration of Riptide’s trail of water. Standing in the Emergence whirlpool slows enemies greatly. Nearby allies are healed when Geyser erupts. One target hit by Geyser will take additional damage, and all damage to that target deals damage to nearby enemies. Torrent reduces the cooldowns of all skills on every hit. Alani rides her Riptide wave, launching her forward along its path. Healing with maximum Osmosis stacks reduces the amount of damage the target takes. Moving through Riptide pools generate Osmosis over time. Increases the minimum healing amount from Wellspring. Increases Geyser’s area of effect. Increases the distance Riptide travels. The Emergence whirlpool heals allies.